7:30 at the Fox and Goose. Megson are husband and wife duo Debs Hanna (Vocals, Whistle, Piano Accordion) and Stu Hanna (Guitar, Mandola, Banjo). They are talented live performers with a mix of beautiful vocals, lush harmonies and driving rhythmic guitars. Megson have gained a reputation on the British folk scene for their melodic, amusing and intelligent songwriting, as well as for their inventive musicianship and northern humour. They have visited Wadsworth once before when they gave a superbly entertaining evening to a sellout audience. Four times nominated in the BBC Radio 2 Folk Awards and double winners of the Spiral Earth Awards Megson have just released a new album “Con-tra-dic-shun” which has already gained much critical acclaim The Wadsworth show is a stop off on their album tour showcasing this new material, although some older favourites will be included too. As usual there will be cask ale, hot food and a warm welcome. Klezmer, swing, gypsy music concert by the amazing Manouche North band. Listen and dance! Despite its humble name, the Rag Market is a veritable faberdashery of creative stalls selling fabrics by the metre, all manner of sewing accessories and high-quality remnants at bargain prices. Keep an eye out for vintage finds, one-of-a-kind pieces and crafty curios across three venues. Many of the stall holders are crafty types reluctantly de-stashing and passing on their bargains to you, but you’ll also find all kinds of makers and sellers. The hunt will take between 1½ and 2 hours, depending how often you stop to read the clues and admire the view! With magnificent views across the valley, there is ‘treasure’ to be found along the way. Some parts may be muddy; stout boots or wellies recommended! 4.00pm Prize Draw at CRAGGIES with prizes for correct answers to the Quiz! 2.30pm, in the The Terrace Room, Hebden Bridge Town Hall, St George's Street, Hebden Bridge HX7 7BY. HBDAF Aims to improve access for people with a wide range of disabilities in the Hebden Bridge area. All disabled people who live in, work in or visit Hebden Bridge and the surrounding parishes are extremely welcome to attend the meeting, or to contact us about membership at sechbdisabilityaccess@gmail.com. We welcome new members with any sort of disability. You are very welcome to have a Personal Assistant, support worker or anyone else to support you at meetings, if wanted. You are welcome to attend regularly, occasionally, or for only part of the meeting, to suit your needs. Please join us! Do you want to help preserve the local social history of the Hebden Bridge and District area? Are you interested in working with community organisations and local schools across the area and the generations? If so, why not get involved in the future work of The Memory Makers project? Come and join us for a cuppa and cake and talk to the group members about our future plans and projects. We will be at the Town Hall Café in Hebden Bridge on Thursday 11 April 2019 between 10am and 12noon. Pop in for a chat or, if you can’t make it, get in touch with us via Helen Doodson, on 01422 392707 or by email. Craving the melodious tones of the Hurdygurdy? If so, come and join us for a truly innovative night. Always a great and vibrant night. Shabby cats play every 1st, 2nd and 4th Sunday of the month. The next of our guided walks. Andy will be there but the walk will be guided this time by Ian. The walk is Jumble Hole Clough this is a great walk in the taking in Staups mill. It is a moderate walk 5.5 to 6 miles. With truly stunning spring views. Meeting 9:30 am at the Fox and Goose leaving around 10ish. The next menstrual kit making workshop will take place on Sunday 7 April 12.00-4.00 at Word of Mouth. Come for as long or short a time as you can and help with sewing, cutting out, finishing off etc. For more background information please see Freedom for girls website or contact Helen 07513 359164 or email. The night features Mick-inspired sets from bands he founded or played a vital role in and representing many sides of Mick’s musical brilliance from his first acid folk songs as a teenager (Amoeba Pie), his love of exploratory mind-expanding improv (Abrasive Pheasants), twisted avant garde songs (Beastfish), wigged out garage psych (The Electric Brains) and Slavic folk-punk (The Ukrainians). with the Canal & River Trust. 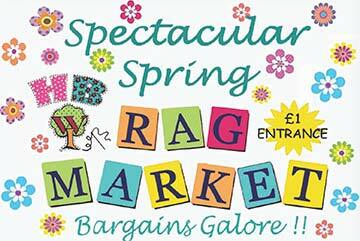 Entry is £2.00 for non-members. What on Earth is going on? Theresa May is about to jump ship, just like Cameron did. Will we have an election? will we leave Europe in April...or May? which year? Can we persuade Jacinda Ardern to come to our rescue...? This month it's one of Shaggy Dog's most treasured events, on Friday, 29th March at Stubbing Wharf. 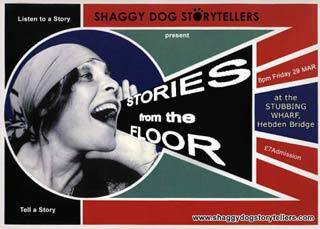 Folks travel from far and near to tell tales, sing narrative songs and or tell monologues or just come and listen to a whole caboodle of short tales, including performances by some of the superb Shaggy Dog Storytellers. Doors open at 7.30 and tales start from 8. If you want to tell your story, legend, myth or fantasy: rehearse, remember, revise, repeat and render on the night (without a script) in 8 minutes or less - you'll get great support from our wonderful Shaggy Dog audience. 4 part self esteem course held at The Hebden Bridge Town Hall. All members of the community most welcome. Free of charge to attend. Registration required for seating arrangements. A Quiz Evening in aid of Healthy Minds is being held at Wadsworth Community Centre on Saturday 30th March starting at 7:30pm. Entry is £5.00 and this includes supper. There will also be a bar. As a keen runner and supporter of mental health charities, Jilly Walstow is doing this as a fundraiser for Healthy Minds (Calderdale well-being) who are sponsoring her to run the London Marathon on 28th April. This event is part of Jilly’s fund raising programme. All monies raised are for this local charity which supports people in Todmorden, Hebden Bridge and Halifax with mental health issues. To book tickets, please contact Jilly 07486 397798. Support a fantastic charity and enjoy an evening of great music, dancing and food! 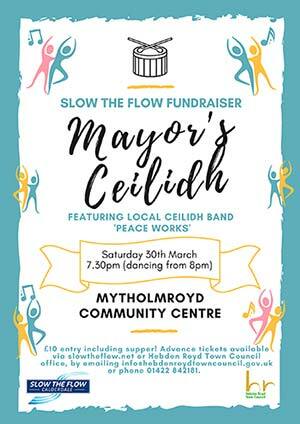 The Mayor of Hebden Royd Cllr Dr Carol Stow and Slow The Flow Calderdale are to hold a fundraising Ceilidh on Saturday 30th March at Mytholmroyd Community Centre at 7.30pm, featuring local Ceilidh band Peace Works. 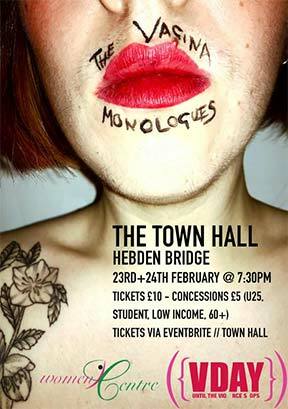 Tickets are priced £10 and include supper too, available via slowtheflow.net or Hebden Royd Town Council office, by emailing info@hebdenroydtowncouncil.gov.uk or phone 01422 842181. The Town Council and Slow The Flow Calderdale have joined forces to stage a conference for 30-31 March, designed for people living with flood risk in their own communities. Please come along and support your local youth brass band - at Hebden Bridge Junior Band's Spring Fayre, Sunday March 31st, 12.30 to 3.30pm. A rare chance to celebrate Mother's Day with home-made cakes and soups, chocolate tombola, raffle, book stall, to meet our new conductor Jack Smith - and hear some great music! Tables cost £7 and all proceeds go to Fire and Water Community Project. Please note this is Mothers' Day, something exciting to bring your mum along to or for a mum to escape to. Christopher Irvin, who conducts the local Little Theatre Choir has a wealth of light music including some of his own compositions. He has formed The Lost Chord Ensemble which meets about once a month and supports the Little Theatre. Musicians (with their music stand) are invited to come and play some light music selections. If you are coming for the first time, please contact chris.browne@tiscali.co.uk with details of your instrument so that a pad of music can be made available. The People Person Show is inspired by the death last July of Simon Shaw. He was the owner of Legacy Comics in Halifax, an aficionado in his genre, a poet, a friend to many and an inspirational guy. A few of his artist friends have come together and produced new works under a collective umbrella, celebrating those with the gift of bringing people and ideas together. Francis Charlton is an artist who was a poetic mentor to Simon, and this time last year he had his first book of poetry published ‘Spectral Lines’ - Verses In Modern Day Technicolour. Also on the first floor of the library, there is a display from the library's collection of newspaper cuttings on the theme of Hebden Bridge Railway Station. 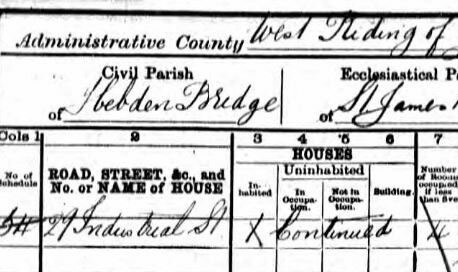 Who was living in Hebden Bridge in the second half of the 19th century? Drawing on census records, this talk will look at individual families and statistics to explore the lives of the people recorded there. Methodist Church, Market St. Hebden Bridge. 7.30. Free to members; £3 for visitors. Greening the Economy: Report of the well attended meeting of 9 March organised by Calderdale Compass and details of the Mytholmroyd meeting coming up on 25 March. Hebden Bridge Film Festival - with Maxine Peake as patron - Hebden Bridge is to host an international Film Festival, from 22nd- 24th March 2019 at the Picture House and the Town Hall. Louise Wadley, Director, of the Festival, told the HebWeb, "We are absolutely thrilled to announce Maxine Peake as our Patron." There'll be friendly advice from e-bike specialists, and a wide range of brands and styles of e-bikes, so that you can ride and compare models and find the right bike for you. Just come along, bring a helmet, and some photo ID (driving licence, passport etc)...and of course all your questions about electric bikes. Refreshments (most likely cake...) will be available! Jo Whitehead's Resplendent Birds exhibition at the Gallery Lounge, Artsmill until 24 March. White Lion pub - Heptonstall, 8.30 til late. Free entry. Come along and play, sing, do spoken word, or just watch and have a drink. 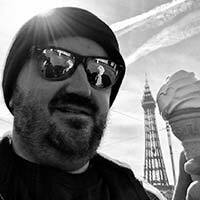 If you fancy performing, friendly sound engineer (Mark) is on hand to help with technical stuff, and an appreciative bunch will normally show up to cheer you on! You know it makes sense. Instigate : Exchange is the latest exhibition with Ebony Andrews & Ian C. Taylor. It is showing from 6-24 March with a preview on Sunday, 3 March. Laughing for Palestine at the Trades Club. 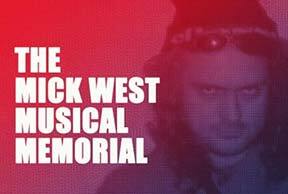 Mock the Week's Tez Ilyas tops the bill on Thurs, 21 March in a fundraiser for the Israeli Committee Against House Demolitions. U3A Todmorden’s next members’ meeting will be on Thursday, March 21st, 2018 in the Central Methodist Church Hall in Todmorden at 1.45. We will be welcoming back Maria Glot. Last time we heard her lively, detailed and entertaining take on Titus Salt and Saltaire; this time she will be talking about ‘After Titus’. (email), or 01422 886021 (phone). The Women of Hebron co-operative provides work for women in the ldna district of Hebron in the occupied West Bank. The women produce beautiful hand-woven and hand-embroidered traditional rugs, cushion covers and other handicrafts, which they sell in the Old Hebron market. The initiative creates work and hope for some 120 women and their families in a city which is frequently at the centre of tensions and violence. Laila Hasan, co-founder of the co-operative, will be speaking about their work and achievements as a form of grassroots, peaceful resistance to occupation and oppression. There will also be the opportunity to purchase some of these lovely artisan products. Arts Festival Open Meeting - a chance to shape the Festival. Weds 20 March. And an opportunity to meet the festival Artistic Director Helen Meller and the Festival Board. Piano Festival programme launch party takes place in the café bar at the Town Hall on Friday 15 March from 6.30pm. There’s live piano music provided by Festival Director, David Nelson. A hundred years on from the deaths at the hands of the Manchester Yeomanry of 15 people attending a reform meeting, Manchester has no major monument to Peterloo. 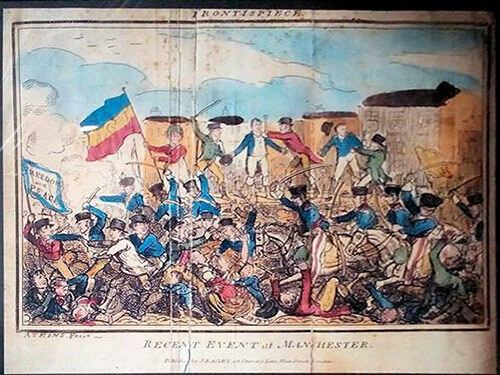 The talk explores both the event itself and Manchester's attempts to remember and also to forget Peterloo. Period poverty is a worldwide issue. We meet monthly in Hebden Bridge to make and sew menstrual kits that are sent overseas to enable young women to continue attending school during their periods. Come & enjoy the fun. Doors 6:45, Wadsworth Community Centre. Edgelarks, aka BBC Award winning duo Phillip Henry & Hannah Martin, make a welcome return to what, according to their website, is one of their favourite venues. Their spring 2019 tour is a very special run of preview concerts promoting their new album. Drawing on the traditions of British Folk the alchemy of her ever-evocative songwriting, fiddle and banjo playing and the much extolled skills of Henry on dobro, harmonica and lap steel fuse into a wholly distinctive world sound. Climate change, air pollution, loss of biodiversity, public health, waste management, food production, etc all require a greening of our economy - reducing the use of coal, oil and gas, insulating all our buildings to the highest standard, expanding renewable energy, improve public transport, etc. How can we do all that when Brexit creates an uncertain economic and political future? To debate this Calderdale Compass is organising a public meeting on Saturday 9th March at 1.30pm at the Waterfront Hall, Hebden Bridge town hall. The speakers include Alan Simpson, who as a Labour MP played an important roll in setting up policies for the renewable energy sector. Councillor James Baker is the leader of the Liberal Democrats at Calderdale Council will also be speaking along with a speaker from the Green Party and Jane Speller from Compass. There is free entry to this event but donations are welcome to cover the hire of the town hall and transport costs. So come and take part in the event. Birds and Beasts Entwined: an Album Party ‘Entwined’ launch at the Trades Club this Saturday (9 March) in Hebden Bridge, where the group will share their new songs and some existing favourites. 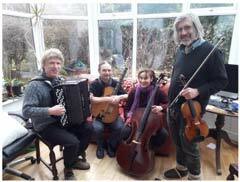 Hebden Bridge Town Hall, Hebden Bridge on Wednesday, 6th March 2019 at 7.30pm in the evening. The next Meeting of Calder Valley Organic Gardeners takes place at Mytholmroyd Community Centre, Caldene Avenue, Mytholmroyd, Hebden Bridge HX7 5AF on Thursday 7th March 2019 at 7.30pm when a there will be a talk on 'Growing Potatoes' with Gordon Nelson. 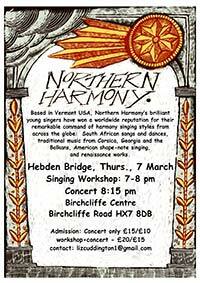 Calder Valley Voices is hosting a workshop and concert at the Birchcliffe Centre on Thursday the 7th March given by the inspirational singers of Northern Harmony from Vermont USA. They perform, teach and sing songs from across the world. The workshop is from 7-8pm and the concert from 8.15-10pm. Hope Baptist Church, New Road, Hebden Bridge, HX7 8EW (please use Hope Street entrance). Refreshments from 6.15pm, meeting starts at 6.45pm. Ward Forums are an opportunity for you to get involved in what happens in your local area and discuss what is important to you. By working together we can talk about local issues and plan for the future. Feedback on the A646 Corridor Improvement Scheme consultation & Plastic Recycling and disposal in Calderdale as well as a police update and an Open Forum. 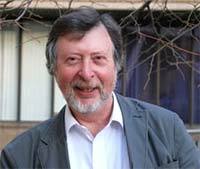 Writing Yorkshire is the topic of the next lecture (2 March) organised by the Lit & Sci with Prof Richard Morris who brings his skills as an archaeologist and historian to weave an account of Yorkshire’s past and present. An evening of mediumship and clairvoyance run by Jilly Walstow is being held at Wadsworth Community Centre on Saturday 2nd March starting at 7:30pm. 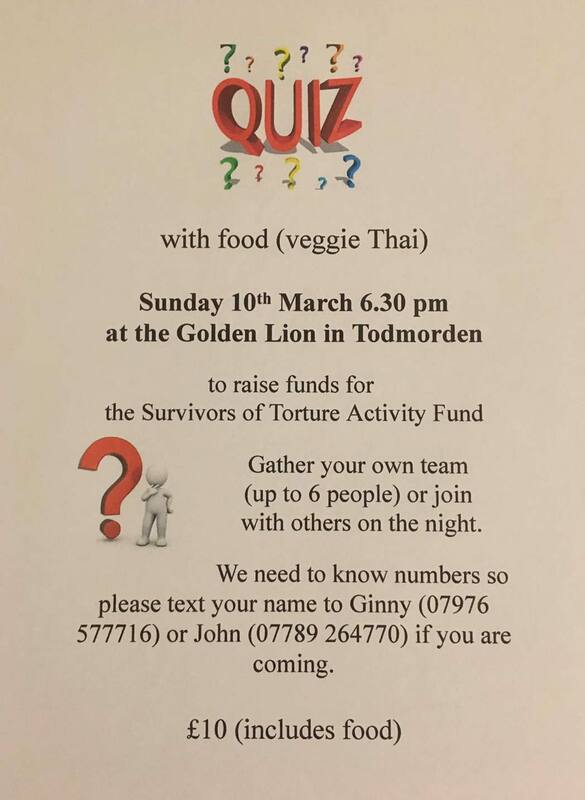 As a keen runner and supporter of mental health charities, Jilly Walstow is doing this as a fundraiser for Healthy Minds (Calderdale well-being). Healthy Minds are sponsoring her to run the London Marathon on 28th April and this event is part of Jilly’s fund raising programme. All monies raised are for this local charity which supports people in Todmorden, Hebden Bridge and Halifax with mental health issues. A fast moving community play that tells the story of the 1643 battle of the same name through a family of clothiers, the Cockcrofts as they struggle to keep the Civil War at a distance, to carry on making cloth, surviving without taking one side or another. Accompanying the narrative, there is both period and original music by arranger and composer Katie Chatburn, all performed in the majestic setting of St Thomas the Apostle Church Heptonstall. The Bookcase, Market Street, Wednesday, 27th February 7pm - 8.30: George Murphy reads from this expanded and updated paperback collection and discusses his time travelling comic Monologues and Songs about round here. 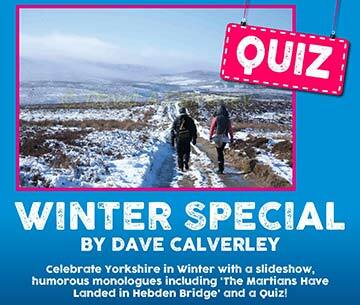 A celebration of flood and UFO defying, Gay, pagan, hippy invaded, tourist teeming Upper Calder. 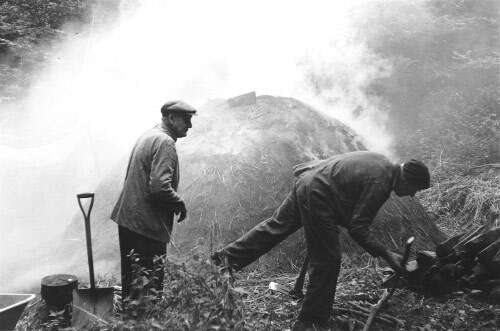 The steep unpromising woodlands of our local valleys played an important part in the industrialisation of the region, a legacy which can be seen to this day. Archaeological, ecological and historical methods have started to reveal the history of their use and significance. This provocative story is the latest episode from Greek Mythology to get Ben Haggarty's 'Myths Unleashed' treatment. Here the veneers of classical civilisation are stripped away and the challenging, and truly awesome, implications of the tales are made clear. About Ben Haggarty: Having been trained in mime, and in theatre direction at East 15, and apprenticed as an image-maker with Welfare State, Ben is one of the world's leading contemporary storytellers, renowned for his passionate and physical performances. He tours widely, has been a guest artist in over one hundred and fifty International Storytelling Festivals in 33 countries and was, for 10 years, the official storyteller with Yo Yo Ma's Silk Road Ensemble. Ben is a much sought after teacher and director of storytellers and artistic director of the legendary Crick Crack Club. He is Honorary Professor of Storytelling at the Arts University of Berlin (UDK). Please note: Stories from the Floor will start at 8.00. Intermission at approx. 8. 30 Ben's performance from 8.45. Arrive early to secure a good seat! Meet at Midgehole Car Park. £5 per person, book online to secure your place. Places limited, dogs on leads welcome. @ the Old Fire Station, Hollins Mill Lane, Sowerby Bridge. Raising money for the Fire and Water Project. Crafts, Arts and Second hand anything and everything. Refreshments and cakes by Jean! Lots of books for sale too. This Book Case event marks new edition of this defining 60s Underground book. Bomb Culture, the best-known book of the late, multi-talented artist / writer / actor Jeff Nuttall, is back in print after 50 years. U3A Todmorden’s next members’ meeting will be on Thursday, February 21st, 2018 in the Central Methodist Church Hall in Todmorden at 1.45. 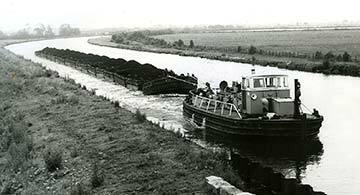 Our speaker w	ill be Philip Caine whose topic will be ‘From Barrow to Baghdad and Back’. Wadsworth Community Centre kicks off its Spring series of gigs with a return visit of Phil Beer. Charming, disarming and exceptionally talented, multi-instrumentalist Phil is something of a national treasure on the folk, roots and acoustic scene. 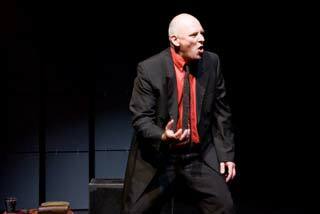 One-half of award-winning powerhouse Show of Hands, Beer is equally in demand for his solo shows. Beer’s flawless musicianship and rich vocals will leave you wide-eyed and wanting more. Best known as a top flight fiddler his skills don’t end there, a prolific composer he also plays slide, Spanish and tenor guitar, mandocello, viola, mandolin and South American cuatro. In support is Alice Jones, a singer, multi-instrumentalist and dancer from Ripponden. Accompanying herself on the piano or harmonium and sometimes only with foot percussion, her distinctive voice and innovative style lends a fresh, modern perspective to traditional material. Tickets are £15 (under 18’s £13). Doors at 6:45, show at 8:00. 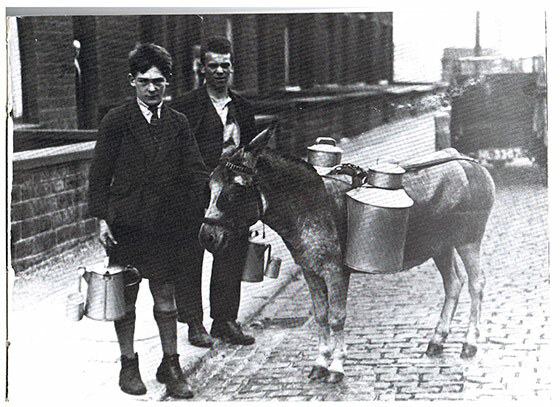 Surprisingly few people are aware of the way the rise of industry in the Pennines opened up opportunites for commercial farming to which local families enthusiastically responded. So how was the feeding of ever larger populations achieved on land described in Tudor times as 'a great waste and moor'? Artsmill Exhibition: Where Earth Meets Sky - Claire Murray's work embraces the rich and dramatic landscapes and seascapes of the North, concerning mainly ideas of memory and recall, and running from 23 Jan until 10 Feb.
Nic Chapman is a photographer with an artistic flare and an eye for detail. Her exhibition is showing in the Gallery Lounge from Weds 30 January with a preview on Sunday, 27 January. One day Positive Thinking course held at The Hebden Bridge Town Hall. Continuing the story of the children's radio request programme - a lively talk with music from the 60s & 70s. A relaxed and supportive session for Fiddlers of all abilities. Come and share your skills, pick up tips, join in a few tunes and perhaps stay for the equally friendly 'string thing' music session afterwards. Public Meeting: Brexit - What Next? Our parliament is in deadlock over Brexit - some want to remain, some want no deal, some want a Norway style deal, and others want a referendum on the final deal. Can we unite to stop a destructive Tory Brexit and their attempts to use it to turn the UK into a low tax, low regulation economy, which will have devastating consequences for our public services and hard won basic rights? Come and join us for our next public meeting to hear local speakers discuss arguments for and against Brexit, plus Compass proposals for a Citizen's Assembly to help ensure all voices are heard and help find a way forward. 7pm. Hebden Bridge Town Hall. 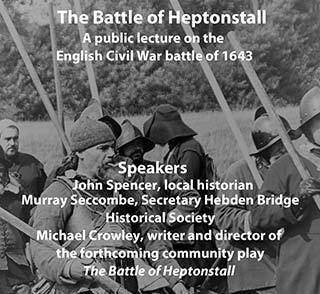 Secretary of Hebden Bridge Historical Society Murray Seccombe will set the scene with an introduction - Dangerous times: life in Halifax parish before the Civil War, followed by historian John Spencer who will talk about the local battle in detail. 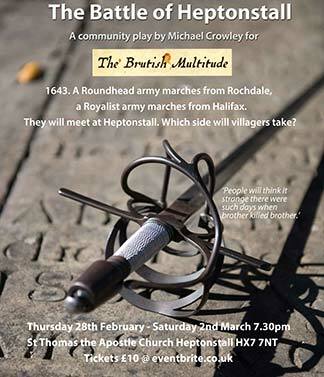 After the break, playwright Michael Crowley will talk about the English Civil War's place in drama and the forthcoming community play The Battle of Heptonstall which will be produced in St Thomas the Apostle Church, Heptonstall at the end of February. A few scenes from the play will be performed as part of the lecture. 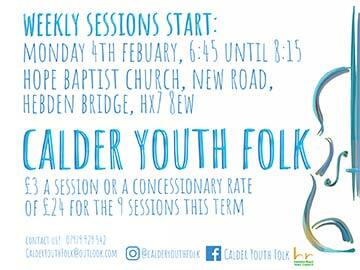 Weekly sessions for the new Calder Youth Folk band begin on Monday at 4th February at the Hope Baptist Church, from 6.45-8.15pm, led by tutor Jenny Trott. 'Turn up to tune up' at 6.30pm. Holocaust Memorial Day Commemoration, 1 - 3pm at Calderdale College, Francis St, Halifax. Free. A representative of the Interfaith Council to speak. Rudi Leavor - chant of the "El Male Rachamim"
Everyone welcome to this Halifax Labour fundraising Barn Dance £6 on the door, children free. Vegan supper for a donation and a raffle to make your eyes water. Join Shaggy Dog Storyteller resident, Ursula Holden Gill as she takes up the plays poignant themes of arranged marriage, rebellion, awakening and acceptance and presents them in an insightful and thoroughly uplifting retelling of the Shakespeare classic, in plain English (apart from a peppering of verse) and with bags of mischief, music & jaw dropping background into the significance of all the old midsummer mayhem. Upstairs in The Stubbing Wharf, King St on Friday 25th January. 8pm. £7 Entry. 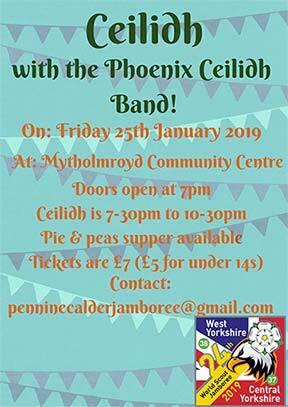 Join us for a night of music and dancing with the Phoenix Ceilidh Band at Mytholmroyd Community Centre. 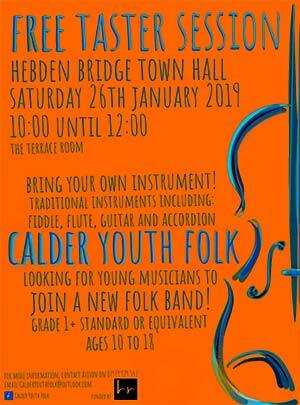 A free informal 'Taster Session' for a new Calder Youth Folk music group on Saturday 26th January from 10 - 12noon at Hebden Bridge Town Hall in the Terrace Room. Any young musicians aged 10-18, grade 1 standard or above, on traditional acoustic instruments (e.g. fiddle, flute, guitar, accordion) are welcome to come along with their instrument. Have a go at learning by ear with folk tutor Jenny Trott and meet other local young musicians. Regular weekly sessions will begin in February. is the topic of next lecture organised by the Lit & Sci with Art historian Susan Owens who will be reflecting on the place that ghosts have in our culture - on Sat 26 January. 2.30pm on, in the The Terrace Room, Hebden Bridge Town Hall, St George's Street, Hebden Bridge HX7 7BY.HBDAF Aims to improve access for people with a wide range of disabilities in the Hebden Bridge area. All disabled people who live in, work in or visit Hebden Bridge and the surrounding parishes are extremely welcome to attend the meeting, or to contact us about membership, please email. We welcome new members with any sort of disability. U3A Todmorden’s next members’ meeting will be on Thursday, January 17th in the Central Methodist Church Hall in Todmorden at 1.45. We will be welcoming the return of Ray Riches and Peter Thornton who will be more tales from their time with ‘Pathways and Film Production’. Fancy learning a new skill? 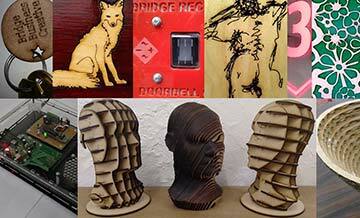 Want access to a high quality laser-cutter? No previous experience needed. Laser-cutting can be used for: artwork, attractive cases, mechanical components, special mountings, lampshades, intricate paper cuts/ invitation cards, sliced 3D forms. Materials include: acrylic sheet, wood, cardboard, paper, glass engraving, . . . .
Produce your own piece to take away, free of charge. Bridge Rectifier is a not-for-profit community hackerspace/ makerspace. Open Evenings run 7 to 9 pm every Wednesday. Mods and rockers alike are invited to January's Friends of the Picture House ouse screening of The Who's 1979 film Quadrophenia. 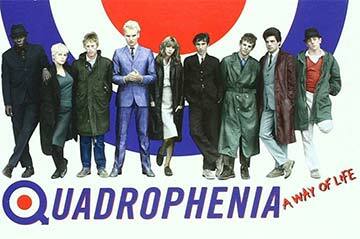 Although not a musical like Ken Russel's earlier film of Tommy, Quadrophenia is loosely based on the 1973 album of the same name and captures the London-Brighton milieu of the band's youth. Lambrettas, drugs, all-night discos, loose morals and, of course, massive punch-ups with Kinks fans pepper the film which is pretty much a sacred text of mod life. The huge cast features Phil Daniels, Leslie Ash, Timothy Spall, Sting, Toyah Wilcox and Ray Winstone. 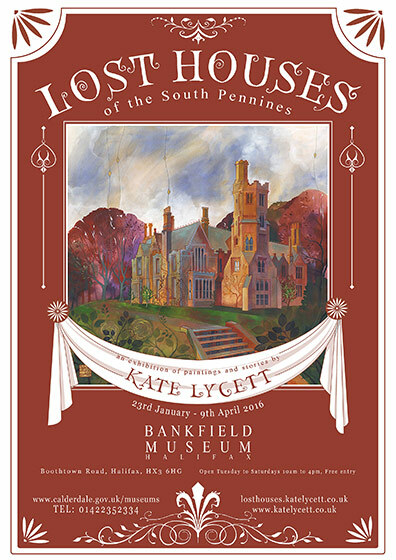 Kate's fantastic pictures of the lost houses of the South Pennines first exhibited in 2015 were inspired by research in the local archives. In this talk she shares some of the stories she learned in her quest to breathe a little life and colour into forgotten houses. New Year . . . . . . new career? Come and find out more about fostering with Sarah Hancockfrom the Foster for Calderdale Team. Sarah will be available at Welcome Independent Living's Community Hub on Market Street in Hebden Bridge (diagonally opposite the Co-op) on Thursday 10 January between 10 a.m. and 1 p.m.
Why not call in for coffee and an informal chat? She will be happy to answer your questions and provide information for you to take away. Tel: 01422 419624 (Community Hub). with popular speaker Malcolm Johnson. Join our festive event full of Christmas cheer, mince pies and a free raffle. The usual thing, that nice Dave Boardman chap with ask questions, you will know some, but have to persuade the person with the pen to write down your suggested answers, then be overjoyed if your answers turn out to be correct. New year resolution pledges are on the horizon! A fabulous way to become healthier is to go plant based. It's also better for the environment and kinder to animals. Come to our film and talk night to help you to go vegan.